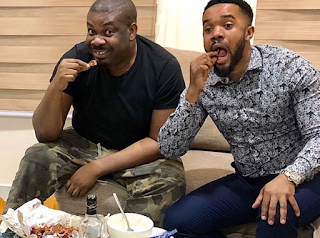 Michael Collins Ajereh, better known as Don Jazzy was seen in a new photo with actor Williams Uchemba as they hang out together. They were seen all smiles eating suya and drinking garri. "With the President of (SGCP)SUYA NAD GARRI CONSUMERS PARTY and his running mate(my humble self), strategizing on how solve the pressing issue in front of us. @donjazzy #suyagang"